It was just after 12:30 p.m. Tuesday at Clifford J. Lawrence Junior High School. 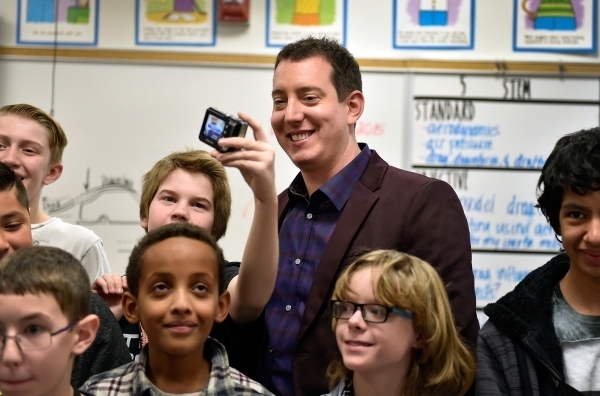 Kyle T. Busch, originally of Las Vegas, now of a compound on a lake near Charlotte, N.C. — aka “your 2015 NASCAR Sprint Cup Series champion” — was having his ear bent by a school district trustee in the hallway outside Stacy Schaumburg’s STEM classroom. STEM is an acronym for science, technology, engineering and mathematics. Or as the academically challenged guys who played sports at my old school might have put it, a D, D, D and an F.
After a Kylie Jenner-like number of selfies were touch-screened onto the school district trustee’s cellphone, Kyle Busch was allowed to enter the classroom. He was wearing a maroon blazer, dark plaid shirt, skinny jeans, brown loafers. In the first upset of the brief stock car racing postseason, none of the champ’s attire was festooned with M&M’s patches or other sponsor logos. 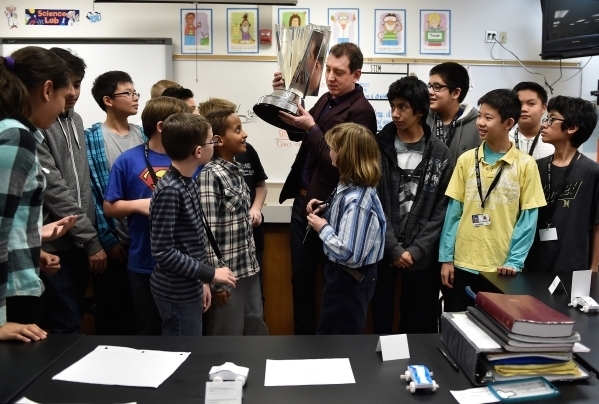 The schoolkids in Mrs. Schaumburg’s STEM class — 17 boys, two girls — applauded politely, and 2015 NASCAR Champion’s Week officially was under way. The schoolkids came prepared. 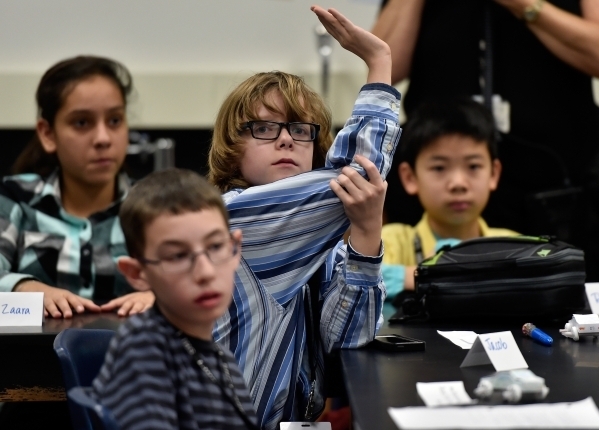 Many seemed precocious, like the kid with the glasses in “Jerry McGuire.” They peppered the Las Vegas lead foot with nonstop questions — way better questions than Stephen Colbert had asked on late night TV the day after Busch held off rival Kevin Harvick in the Miami suburbs to claim his first NASCAR Cup Series title at age 30. Busch stood in front of a diagram that Stacy Schaumburg had drawn on the eraser board. It illustrated the concepts of downforce, drag and draft. When I told the teacher that was better than anything Larry McReynolds “hisself” could have drawn up on TV, she came clean: That came straight out of NASCAR’s Acceleration Nation press kit, she said. A road sign tacked to the wall said one should “Pass With Hard Work.” It did not say one should pass with reckless abandon, the way Joey Logano and Matt Kenseth do it. When one of the schoolkids asked Busch about what advantages his car had on this year’s competition, he did not come clean like Mrs. Schaumburg. He said NASCAR does not allow one car to have an advantage over the over cars. Not even the No. 88 car (driven by Dale Earnhardt Jr.). He could have said the No. 18 had a better driver, and that was an unfair advantage, but that would have been blowing his own horn. This classroom was festooned with a giant NASCAR Champion’s Week backdrop. After a few more selfies were posed for, Kyle Busch was allowed to make another entrance. The men from the press (and Channel 3’s Amber Dixon) said we wish you success, like in that old John Lennon song about the dock in Southampton and eating chocolate cake in a bag. They asked the same questions that Busch probably has been asked 100 times since he held off Kevin Harvick. As John said in that ballad about he and Yoko, “Christ, you know it ain’t easy.” But Busch answered every repetitive question with a smile. These NASCAR drivers still are real good about making themselves available to the press, and real good at smiling when they are asked repetitive questions. This is a foreign concept to many of today’s ballplayers, and to Marshawn Lynch of the Seahawks. When it was my turn, I asked the new champ, and man of countless hours this week, what kind of grades he got while attending Hyde Park Junior High down the road. He said A’s and B’s. When he was sitting in those little desks with the chair bolted on, it would have been about 17 years ago, when Jeff Gordon was NASCAR champion — when young Kyle Busch would have been dreaming about being like him. I think he was talking about his parents, Tom and Gaye. 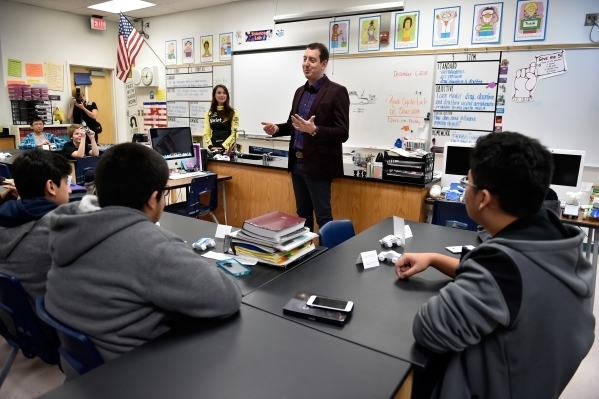 Only one kid in the STEM class had raised his hand when Busch asked who among them wanted to be a stock car racing driver. One wearing glasses inquired about being an engineer. On our way out, other schoolkids were walking across the commons on the way to class. 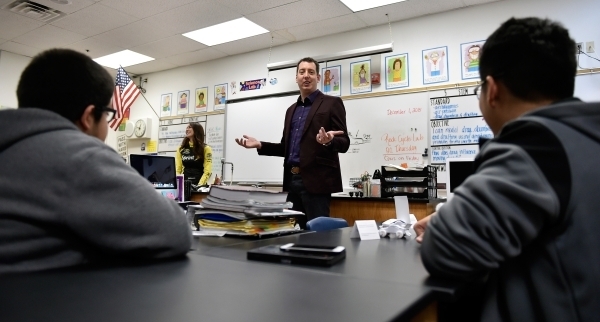 Most seemed oblivious that Kyle Busch, aka “your 2015 NASCAR Sprint Cup Series champion,” was being asked repetitive questions in the classroom down the hall.